When trapped between two kings, even a pawn can change the game. On behalf of Relativity Media, we are pleased to share the official trailer for their upcoming thriller, PARANOIA. Liam Hemsworth, Gary Oldman, Amber Heard and Harrison Ford star in the highly anticipated summer film, based on the best-selling novel by Joseph Finder. The two most powerful tech billionaires in the world (Oldman and Ford) are bitter rivals with a complicated past. When a young new superstar (Hemsworth), seduced by unlimited wealth and power, falls between them, he becomes trapped in the middle of ttheir life-and-death game of corporate espionage. 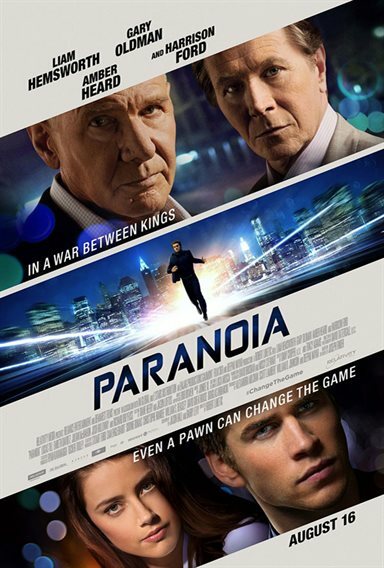 Download Paranoia in Digital HD from the iTunes store. Paranoia images are © Relativity Media. All Rights Reserved. Paranoia is one of those films that probably looked great on paper—and maybe even on its actual promotional poster—but which is about as exciting as watching paint dry. This supposed thriller posits Liam Hemsworth as Adam Cassidy a young buck at a high tech firm who dreams of migrating across the river into Manhattan and taking the world by storm. Unfortunately, he's stuck in a low level job as one of countless drones living out their days in cubicles while watching their superiors take home obscene bonuses. Adam has come up with a brilliant idea he wants to pitch to his company's Chief Executive Officer, Nicolas Wyatt (Gary Oldman), something to do with smartphones being able to access social media (ummm—isn't that already a possibility?). Wyatt is singularly unimpressed and fires Adam and his cohorts on the spot. Adam then makes the really smart decision to use a corporate expense credit card he still has to take his former work colleagues out for a night on the town, racking up a bill of $16,000 (hey, it's New York and it isn't happy hour any longer). He catches the eye of a pretty lass at a club and the two end up in bed together. The next morning he's summoned rather brusquely into Wyatt's executive suite where he's issued an ultimatum: either agree to be groomed to infiltrate Wyatt's chief nemesis' high tech firm in order to steal corporate secrets, or go to prison for credit card fraud. Adam is pained, yes pained (Hemsworth's expressions throughout this film seem to indicate he's passing rather large kidney stones quite a bit of the time), but of course agrees. Things aren't all bad, though, since Wyatt's coterie of henchmen (and women) line up to remake Adam in a socially acceptable corporate image. That includes new clothes, a new car and a super luxe Manhattan apartment. We're barely fifteen minutes into this heaping pile of pretension, and already it has strained credulity to beyond the breaking point. It doesn't take a rocket scientist to figure out that Adam is indeed able to infiltrate the new high tech company, where he engages in romantic escapades with Emma (Amber Heard), his erstwhile one night stand. He also ingratiates himself to the new company's head honcho, Jock Goddard (Harrison Ford), who has a rather twisted history with Adam's "real" employer, Wyatt. The whole silly enterprise revolves around all knowing, all seeing smartphones, which as anyone with anything newer than a flip phone can tell you is decidedly old news. Paranoia trots out its supposedly breathtaking revelations about nefarious software as if this information would be enough to provoke gasps of horror in the audience, when the most likely response is instead going to be "And your point is?" It's actually a little depressing just how rote and formulaic Paranoia is. Rarely has corporate intrigue been so, well, unintriguing. Oldman is curiously tamped down here (it might have been fun had been encouraged to let loose with one of his famously hyperbolic performances), and Ford isn't much more energetic himself (plus, the weird decision to shear him of all of his hair makes him look like a recent chemotherapy survivor). Hemsworth is frankly embarrassing in this role. He struts athletically (and the film of course gives him plenty of opportunities to show off his naked upper body), but his performance is just plain laughable most of the time. Only Richard Dreyfuss, as Adam's workaday father, seems to be having a little fun, though his part is barely even a cameo. Maybe he should be thanking his lucky stars. Paranoia is presented on Blu-ray courtesy of 20th Century Fox Home Entertainment and Relativity Media with an AVC encoded 1080p transfer in 2.40:1. The film has a sleek, glistening appearance that ably supports the story of very wealthy people living and working in very tony surroundings. Colors, while occasionally graded, look generally accurate and are nicely saturated, especially in some of the outdoor scenes (look at the screenshot of Adam walking around the grounds of Jock's palatial mansion). The film utilizes the ever popular aerial establishing shots (repeatedly), and a couple of those have just very slight stabilization issues, with extremely minor shimmer wavering through some of the skyscrapers' parallel lines. 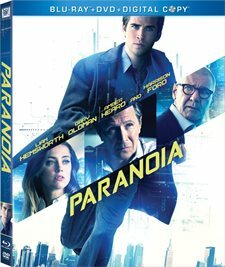 Paranoia's lossless DTS-HD Master Audio 5.1 track is very well done, though the film tends to resort to supposedly hushed, "intense" dialogue scenes most of the time, which leaves surround activity relegated to things like the busy cityscape of Manhattan or the quieter confines of the sylvan grounds of Jock's estate. Dialogue is very cleanly presented and the track has no problems of any kind to report. Privacy is Dead: begins with some helpful dictionary definitions of privacy and then moves on to pointless interviews with the cast and crew where they all complain about cameras being everywhere (without seeming to understand the irony of them being filmed at the moment). The Paranoia Begins: talks about Joseph Finder's source novel, including interviews with Finder and producer Alexandra Milchan. The Players: profiles the cast. This movie about evil, evil smartphones is just plain dumb. A game cast and some good location work can't save this train wreck. Even fans of any of the stars will be hard pressed to find anything worthwhile here, though at least the technical merits of the Blu-ray are first rate. Paranoia images © Relativity Media. All Rights Reserved.